Welcome to: Original Bird Whistles - Imitate Bird Calls & Bird Sounds! Discover your own bird sounds..
Imitate Bird Sounds with this Amazing Instrument! Imitate the beautiful sounds of the blackbird, the nightingale, the canary, the sparrow, or ..
.. just make any sound you like! Developed over the years to perfection, this is the most advanced mouth bird whistle on the market today. The 'heart of the whistle' is a thin quality membrane (a long kept secret! ), clamped tight & fixed for a high and clear sound. The usage of durable quality materials makes the white, jagged 'body-part' of the whistle very durable and easily shaping against the palate. You do not have to be a skilled whistler to make this work. If you can say "cheese", you can make the bird whistle sing. ..put it gently up against the palate (roof of your mouth) with your tongue, and blow/say sounds like "TSH..." as in: 'Chips or Chocolate'. You can clean your whistle by holding it under tap water for a few seconds, dry it in fresh air, and you can use it again whenever you want. If you want to whistle again, just simply put the bird whistle back in your mouth, wet it a little, and there you go again! With some care you can have endless fun, up to weeks, which every single whistle. 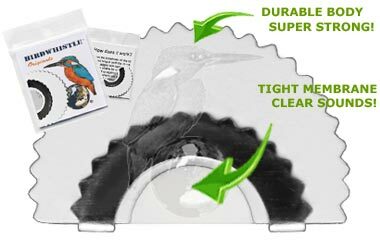 Every single bird whistle is packed separately in the original packaging - containing a quick manual printed on special hp-neutral archival paper. This means that this amazingly small instrument is the perfect original surprise that you can also store for years - ready for action. All year round there are countless occasions where you can impress people, birds & other animals around you! In 20 years of bird whistle business we have reached thousands of customers across the globe - even to the utter most remote destinations! Every single order is secured by PayPal, so that means total transparancy and full warranty on your purchase. On top of that you will get "our beloved personal quality & delivery guarantee!" "Thanks so much for your great service. I appreciate the fast reply and it's a pleasure to deal with such honest retailers - A rarity these days. Thanks again." "school would be a million times more fun"
"I played this vid and my Quaker parrot started squawking X3"
"The whistles have arrived. Expect another order sooner than later as I cannot give them out fast enough. Thank you." "i just got mine, they are fantastic!!" "Thank You. Looking forward to lots of bird whistling in the Rocky Mountain National Park with loved ones .... Take Care Thank you." "To All at Original Bird Whistles, Thank you for your message and prompt shipment. I look forward to receiving the package! Sincerely, ~Chris"
"I stumbled across your product as I was looking for this exact whistle which is the one I remember from when I was a child. When I found it I decided to buy it as a birthday gift for myself and I also hope that I can share the same fun and memories I had while using it some thirty years ago with my own kids." "Thank you for your prompt service. I have a son and grandson who will be delighted with your products, the forebears of which I remember well from the fun I had with them 60 years ago!" "Thank you. I had bought a couple of these Bird Whistles many years ago at a market in Sydney but I lost them. I was so pleased to find them for sale online and I'm thrilled they are coming all the way from wonderful Amsterdam. I'm sure they will bring my family hours of enjoyment. Thank you for making such fun toys! With kind regards"
"They actually just got here yesterday evening! c: Thanks so much! I'm extremely happy with the whistles, they're so much fun! " "Awesome! I'm making a fursuit and my friends are making one too and we have the ones that squeak. I'm looking for 2 nightingale whistles"
"Hello, I've bought from you before and enjoyed your products. It's taken a while to find you, BUT I DID ! Just placed a small order of 10 assorted whistles. Are you a bird lover? I'm in the north east USA; we have many cardinals, titmouse, robins, bluebirds. Thanks very much. <3 "
"You are so amazing! I am so excited for these - we are using them in a musical so I'm sure they will all be put to good use. Thank you so much ☺"
"Thank you for your quick reply and all that you are doing to help me. P.s. I just want to inform you that this has been the best customer service I have ever gotten from any company. Thank you for your wonderful service." "My whistles arrived yesterday- they are AWESOME!!!! Thank you for having an easy website to order from, a super cool product, a great price and speedy delivery service. I am so looking forward to sharing these with the children at our camping get together. It was VERY easy to use the bird whistle- I am so very pleased!" Robinmarie Kail, Warminster, PA U.S.A.
"My husband remembered these whistles from when he was little and wants to surprise his 90 year old father with them. Thanks so much for your prompt reply." "Thank you very much. It was happy surprise finding Kanji on envelope. We very enjoyed Original Bird Whistles by practice." "Cheers whistlers, looking forward to a summer of monumental trilling good warblefests." "Hi, I am happy the packet arrived to me very soon. Many many thanks!!!" "This is definitely the best I've ever used. The sound is much crisper than other whistles, and the pitch is perfect." "Thanks, I have got them today and i am very happy !!!!!." "My bird whistles have arrived today. They are very fun to play with. I will surely recommend them to my friends and family. Right now I am mastering the sound:) Have a nice day." "feel free to add in any other amsterdam goodies ;)! " "Oh, thanks so much for sending the whistles. They came last night. Our family party is tonight...so, a big thanks for rushing them to us. Have a wonderful new year!" "Excellent! Thank you for sending my order so quickly. I can hardly wait! Cheers,"
"Thanks for shipping the whistles quickly. I have a set that I ordered last year. These whistles work very well and I was very pleased to have them. We have a lot of Warblers here and many other species so it will be great fun to see if I can get their attention and make it a little easier to get their photograph. I love watching and photographing birds, ducks and other wildlife, and we have a very large variety of birds either nesting here or stopping over during their migration. Thank you"
"they are so worth it ^o^ i love them;"
"Thanks for your message, I am looking forward to surprise my family with those amazing sounds, especially the blackbird (it is my favourite bird) ;)." "I received the Original Bird Whistles yesterday and within 5 minutes I was whistling. I would love to tell you that they are far beyond my expectations. Just incredible sound I never expected. It took a little time trying to place the whistle just right on the roof of my mouth and be able to use my tongue to make the sounds. I love it so much I put it and your add on my Facebook page. Please keep up the super great work. I just love them. Thanks for making a great product. Best of luck in your future." "I know them from long time ago, it must be more than 30 years, I think. It's great to find the real bird calls back. Good work!" "OMG! I had these as a kid, and I've missed 'em. Toooo the website!" "Cool video, My girlfriend can't whistle so I thought this would be a fun gift for her. I look forward to playing with it." "i remember when they sold those things lool XD so ancient!!" "Great whistles! I been practicing for a couple of weeks and I'm learning. Once you figure out how to hold it, the rest falls into place. The guys in the video is awesome!!! I can do probably 10 bird sounds so far. I would definitely buy more again." "thanks for the follow-up email... i am most excited after watching the videos and can't wait to give it a try... i bought the pack so i could make sure all my bird watching friends could have a go too... thanks again..."
"Thank you for your email, I am very happy to be able to get one as my friend got one and im able to get one too and I thank you for your helpful co-operation"
"Thanks for the response, greatly appreciate it! I might be doing huge bulk orders if these whistles are a success here! I bought them in London like 8 years ago! Luckily I found them online now, for my Halloween costume! I'm looking forward to doing more business with you guys!" "Thank you Donna, it did arrive today. Just as I remember from my youth, pure fun. My kids and I are having a blast. Thank you for the quick response." "My son recieved his whistles today.This is great, my husband and I used to play with them when we were younger. Thank you for the smiles and memories." "Im absoloutely sure that this is what the famous FurSuiter Telephone uses :P I want one Lol"
"Hello!! My bird whistles arrived TODAY!! Thank you so much! I am trying to learn how to use them right now. Thank you again and have a wonderful day!" Thank you! I have now received the package and its in good condition! "I got 20 - I'm the coolest kid at school"